We visit supermarkets regularly, so perhaps we actively stay up to date with offers / deals on social media more than we do compared to other businesses. You won’t have too far to travel to find your nearest [insert supermarket name here] – maybe that constant offline exposure to the brand makes us trust them more than other businesses and therefore more likely to participate in competitions. Or, maybe there’s some other reasons… but in any case I wanted to do a comparison of them all to get an idea of who’s putting in the most work on social media and whether there are any surprises or supermarkets that are punching above / below their weight. I looked at 14 in total. There are probably some others, but i think I’ve covered all the major names. Although twitter stats aren’t included in the infographic below, i did some research on twitter reach too. Interestingly, while all 14 have a Facebook page, just 10 have an official Irish twitter account (Tesco don’t have a dedicated Ireland twitter). Of the 10 supermarkets that have a twitter account, 3 had posted no tweets over the past 7 days, one supermarket posted twice and one posted 3 times. So in total, of all 14 supermarkets, just 4 had a tweet ratio of greater than 1 tweet per day. 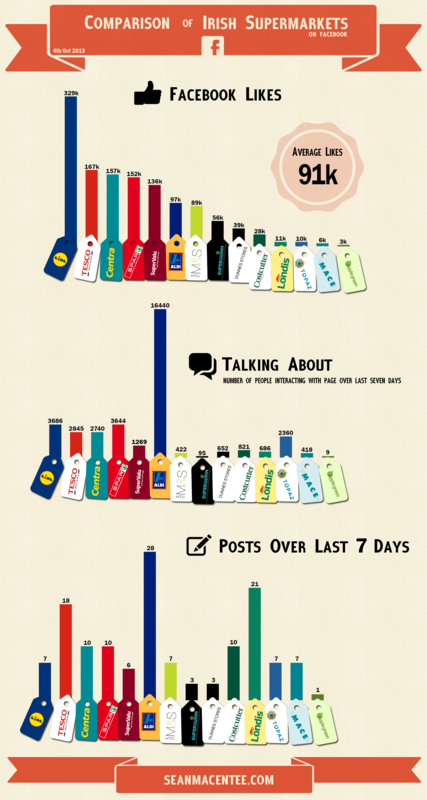 10 supermarkets had a post ratio on Facebook of greater than 1 post per day. That was a surprise for me… it’s clear twitter is being neglected and supermarkets are more concerned with Facebook. Lidl are the most liked supermarket in Ireland on Facebook… head and shoulders above every else. Tesco are 2nd followed by a surprise package (for me anyway) in Centra. However, if you take a look in the ‘talking about’ chart, you’ll see Aldi are destroying the competition… why is this? Well, if you look at the ‘posts over last 7 days’ chart, you’ll see Aldi come in top spot again. 28 posts over the past 7 days. They tend to post tried and tested memes along with their in store offers and that combination seems to be working well for them. If they maintain that kind of engagement, we’ll soon see them challenge Tesco, Centra, Spar and Supervalu for the ‘2nd most liked supermarket in Ireland’ spot. Correlation between store numbers & total facebook likes? Centra seem to top the charts here followed closely by Spar. No real pattern or correlation between total physical stores & facebook likes though so whilst we’re now educated in how many stores each supermarket has in Ireland, it’s yet another mildly interesting but rather useless piece of information.